India has the largest rail network in Asia. Mass people in this nation prefer to take short as well as long journeys by train only. It is obvious that the government and railway ministry take special care of railways and different trains to make the travellers comfortable. In 2014, the Modi government has given another treat to the Indian traveller by introducing premium (Suvidha) trains across the country. The trains will be bit expensive but will be available in the time of rush. These trains will be available to share the load of passengers travelling long distance during summer vacations and such. Suvidha trains will be available at the time of the rush, especially in the time of festive seasons. Unlike other trains, tickets will be available for this train on a short notice. These are premium trains and will be charged more than normal trains in India. The facilities and timing are same as the other premium trains offer in India. There will be only general quota booking, no other sorts of quota or reservation is available in Suvidha Trains. In Suvidha trains the tickets are available online or through PRS counters. The fare of these trains is more than the normal trains also with each 20% reservation of the seats; the fare will be increased over time. Tickets can be booked prior to 10 days of the journey. 1st class/ 1st AC/ executive / general class or 2nd chair car – all these are not available in Suvidha train. There is no cancellation process. In case of urgency and situation one may receive the full refund but generally there is no such cancellation process. At the first place the Railway boards started the ticket booking for Suvidha Trains through online system only. Indian Railways’ official website IRCTC has the entire process of booking tickets online for the suvidha trains. Later on the Railway board has started the provision of selling tickets across the railway counters. Many a people who are not aware of online booking system were unable to book tickets for these trains. So they have introduced the counter bookings as well. There are only confirmed tickets and RAC (Reservation Against Cancellation) Tickets will be available in these trains. Ticket price of these Subidha Trains is bit higher than the normal express trains. There are service taxes, reservation charges and superfast charges will be applicable. With every 20% seat bookings, the price of the tickets for the remaining seats will get increased. Booking is available till the 10 days prior to the journey. After that no tickets will be available. In case of cancellation, Rs. 200/- will be charged for AC II-Tier tickets, Rs. 180/- will be charged for AC II-Tier tickets and Rs. 120/- will be charged for Sleeper Class. The cancellation can be done till 6 hours prior to journey. After that cancellation will not bring any refund. These trains had launched in the year 2014 on the month of July. The trial run had taken place from Gorakhpur to Anand Vihar. These trains are available, as mentioned, during summer rush and festive seasons. Also if there is any need trains can be available during winter vacations. 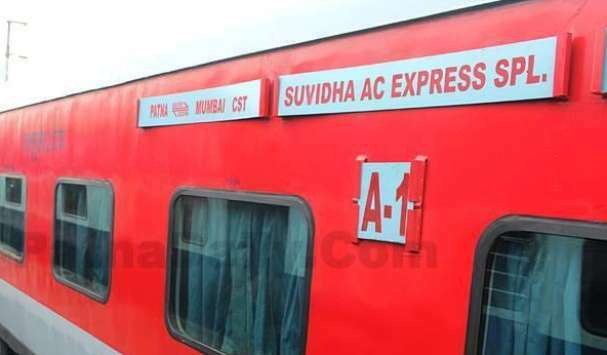 There are three types of Suvidha trains available as of now. Fully AC-nonstop trains, AC and Non-AC nonstop trains and finally AC and Non-AC trains with stops. Available During Summer rush, Festive seasons and Winter rush.